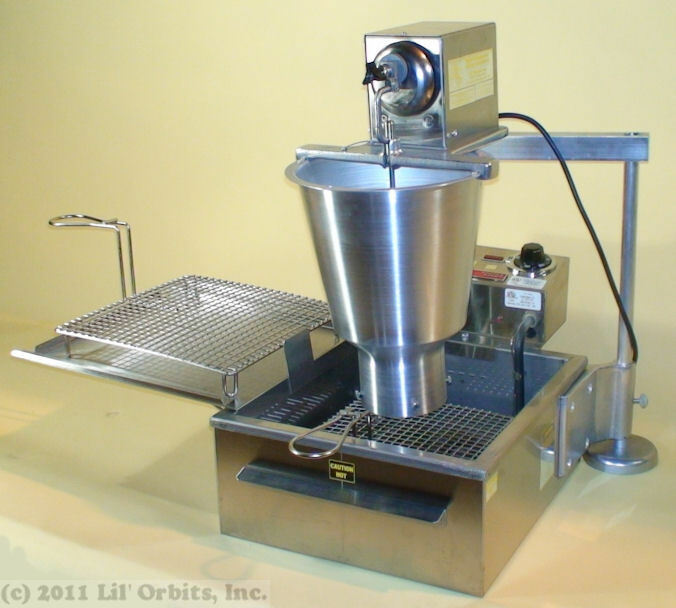 The Lil' Orbits Model 800 mini donut machine was designed to be a great alternative for smaller operations where space may be an issue. Lightweight and portable - takes up less than 3 square feet of counter space and weighs only 37 pounds. Completely speed controlled - control your output to match demand --up to 800 mini donuts per hour. Can be used to make anything! Automatically drops up to four sizes of donuts, donut holes and loukoumathes -- or remove the hopper and simply hand drop items into the fryer. More information about our quick change hopper system below. By using our quick-change hopper system, the Model 800 will produce donuts in 4 different sizes, plus additional specialty items. Simply exchange the hopper bowl and piston combination to produce a different size. Make anything. Allow the machine to automatically drop one of four sizes of donuts, donut holes and loukoumathes or drop hand cut items into the fryer. Use as a universal fryer for all kinds of foods... french fries, egg rolls, breaded veggies, anything that needs to be fried. No modification needs to be made - simply push the donut hopper out of the way and drop items into oil. Space saving. Takes up less than 3 square feet of counter space and weighs only 37 pounds. Speed controlled. Control the output of your donuts to match demand -- up to 800 high-profit mini-donuts per hour. Convenient cooking. Items are dropped on top of a frying screen for easy removal and drying. Two screens are included with the machine. Heavy-duty switches for commercial operation. North American machines are fitted with 5-20P NEMA plug, and should only be inserted into a receptacle rated at 5-20R. (Click link to view image of NEMA configuration).